There are more than 600,000 foreign workers working in the marine, processing, manufacturing, and construction sectors in Singapore. They form 9% of Singapore’s population and live in hostels and dormitories across the country. In a preliminary study conducted by InfoCorp at the Tuas View Dormitory, cash transactions represent 80% of all payments within the dormitory, which is higher than the national average of 18%.Their high physical cash usage exposes foreign workers to theft and fraud. On top of that, existing banking services meant for citizens are not suitable for these foreign workers; they do not benefit from non-cash payment instruments and online banking services. Finally, and most importantly, the bulk of the foreign workers’ salaries goes to remittance. Popular remittance services such as the Western Union generally offer over-the-counter cash remittance services which further encourage the use of cash. Banked work permit holders in Singapore will withdraw all their payroll in cash from the ATM to send the bulk of it home. Each worker queue from 30 to 60 minutes on average for cash withdrawal. Moreover, remittance using such services is expensive. Even in Singapore, a regional financial hub, these foreign workers are underserved by local banks. Due to their transient nature and unique financial circumstances, addressing their pain points will require a drastically different approach from existing solutions available in the market. 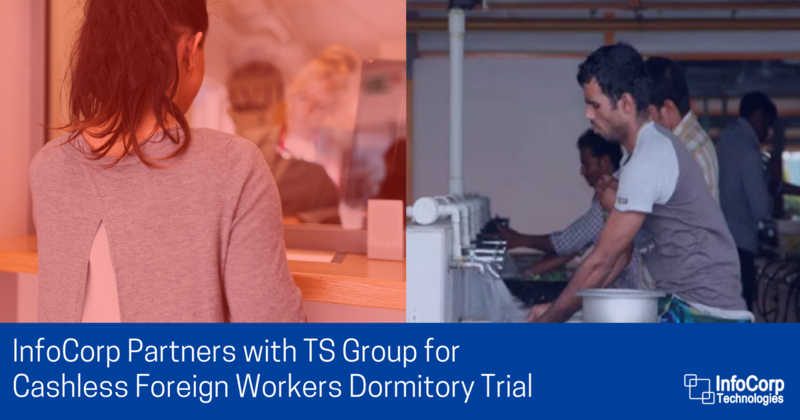 InfoCorp and TS Group of Companies has entered into a partnership to deploy InfoCorp’s CrossPay to foreign workers staying in Tuas View Dormitory and Mandai Dormitory. CrossPay is a blockchain-based mobile delivery mechanism for inclusive banking services, unlike traditional wallet apps providing only payment related services.